For print and Web designers, Stock Photography is a must. Several years ago, there were only a few Free Stock Photography Resources, but now their number has dramatically increased and finding the best ones that offer free high-quality photos can be a headache at best. Do you need a free photo for you next creation? Look no further. 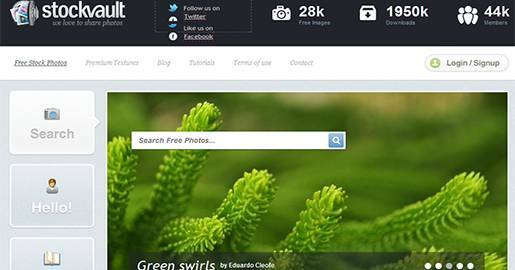 In this article, I list and review the top 21 Stock photography Websites that don´t cost you anything. Go ahead and check them out when considering using stock photography for your next project. Make sure to read any restrictions for photo usage. Read the fine print! Although the following Websites feature free stock photos, it is important to understand any limitations or licensing restrictions on using them. Some of the most common licenses used for the purpose of this post are Royalty Free photos and Public Domain photos. Without further ado, here is my review of the top 21 Websites for print and Web designers to get Free Stock Photos. 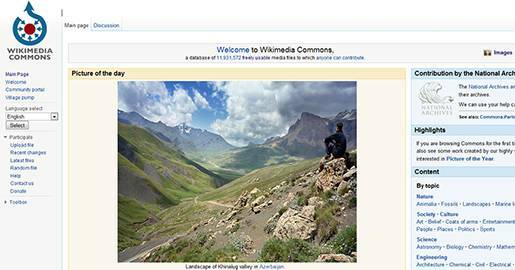 Wikimedia Commons is a database of more than 11,931,572 freely usable media files (images, sound and video clips) to which anyone can contribute and edit. It is a media file repository making available public domain and freely-licensed educational media content to everyone. 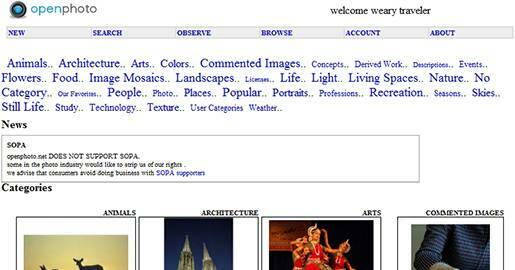 Wikimedia Commons was launched on September 2004 and unlike traditional media repositories, Wikimedia Commons is free. Everyone is allowed to copy, use and modify any files. Stock.XCHNG is a Hungarian Website. 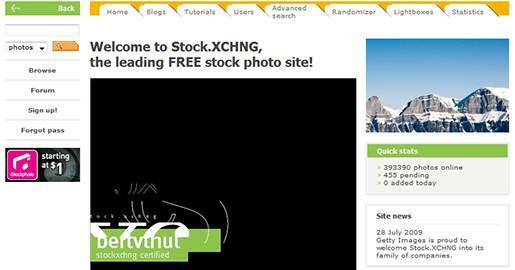 It was founded in 2001 and is the leading free stock photography Website. You can browse through the categories of their huge gallery containing over 350,000 quality stock photos by more than 30,000 photographers, or share your photos with fellow designers. Photographers offer their photos free of charge. 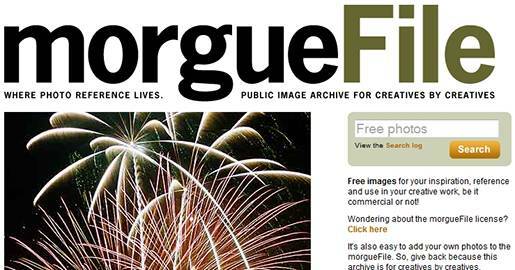 morgueFile started in 1996 and is highly recommended by many Web designers and developers. morgueFile contains free high resolution digital stock photographs for either corporate or public use. The purpose of the Website is to provide free image reference material for illustrators, comic book artist, designers, teachers and other creatives. 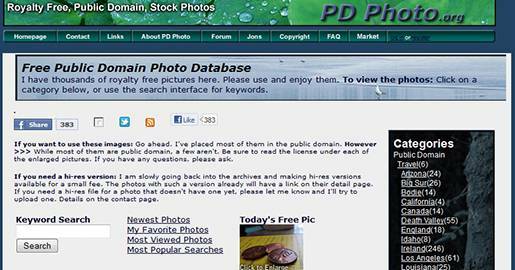 PDPhoto is a repository for public domain photos. You can use the photos for anything, including commercial uses, for other Websites, school projects, articles, ads etc. Public domain means the photos are not protected by copyright and may be freely used. Freerange Stock was established with the goal to provide free quality stock photos for commercial and non-commercial use. Images on the Website are either shot by Freerange Stock, drawn from Freerange archives, or contributed by a community of photographers. Sign up for a free membership, log in, and download high-quality free stock photos and free textures for your next commercial or personal projects. Image*After currently has 27,912 free high resolution textures and images for commercial and personal use. Open Photo is a stock photo gallery started in 1998. Their primary audience is artists, developers, teachers and students. Photos are categorized into multiple categories. 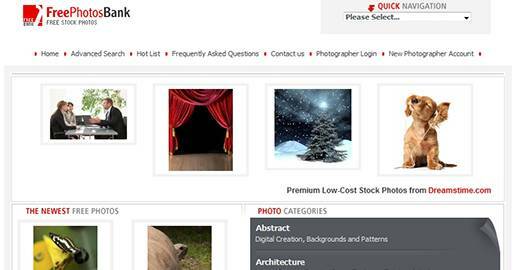 FreePhotosBank is a Free Stock Photos and Free Images provided by various photographers. Photos are categorized into multiple categories with an advanced search filters. 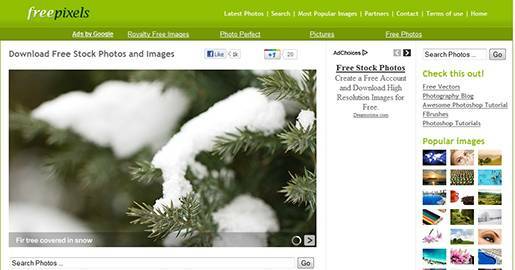 The Free Section of Dreamstime let´s you download high resolution Royalty Free stock images. 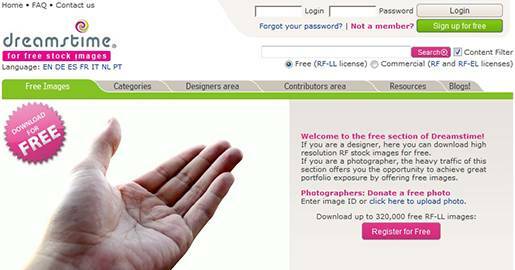 If you are a photographer, the Website offers you the opportunity to achieve exposure by submitting your free images. Download up to 320,000 (licensed under RF-LL) images. Photos can be downloaded by registered users only. 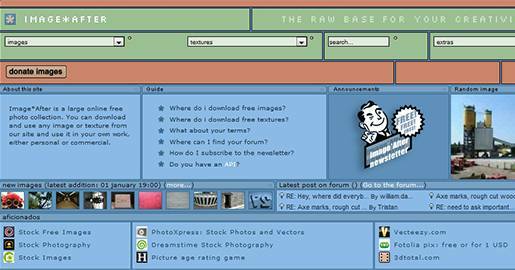 The free section of Dreamstime is fully searchable and constantly updated. Unfortunately, you can only search photos by keyword, with NO advanced search filters. Stockvault was established in 2004 and is a stock photo sharing Website where photographers, designers and students can share their photographs, graphics and image files with each other for free. The images are for non-commercial use. StockVault has over 28,000 free images to choose from and download. Stockvault´s sole purpose is to collect and archive medium and high resolution photographs that designers and students can share and use for their personal and non-commercial design work. Stockvault also have more than 50,599 Royalty Free Textures and Background images. 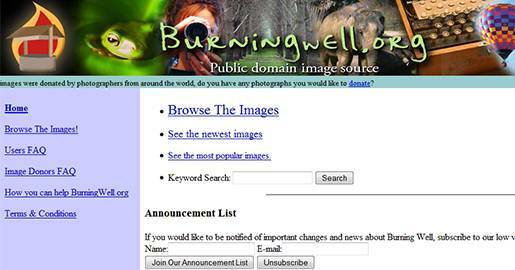 BurningWell is a repository for public domain (free for any use) images. You are free to download, copy and use the photos for any purpose. These free images were donated by photographers from around the world. The images in the BurningWell repository are in the public domain. Basically, this means that you are allowed to use the images freely for any purpose, commercial or private. 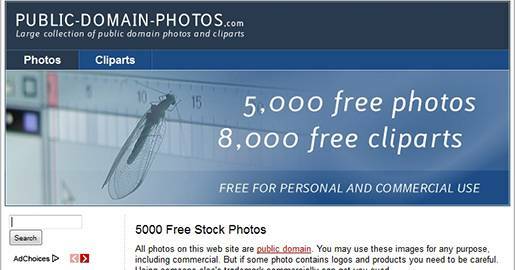 Public-Domain-Photos offers 5,000 Free Stock Photos and 8,000 Free Clip arts. All photos and clip arts on this Website are public domain. You may use these images for any purpose, including commercial. ImageBase offers thousands of free photos that can be used for personal, commercial, or non-profit purposes without any licensing restrictions. The Website also offers free Power Point Templates. Photogen offers high quality, high resolution FREE stock photos and images. 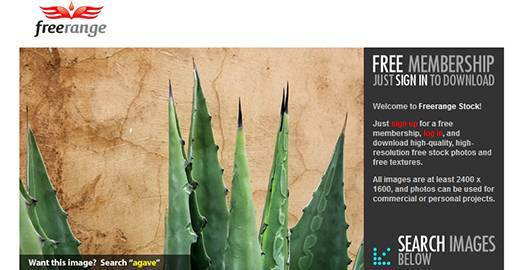 Registered users can download and use Photogen stock photos FREE, both for commercial and personal projects. The Photogen photo gallery is regularly updated with new quality, high-resolution free photos and images. Photogen images are free for commercial and personal use. However, The images are not for resale or redistribution. 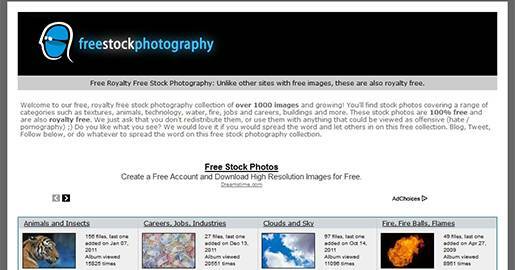 Free Stock Photography is a free and royalty free stock photography collection of over 1,000 images and growing. You will find stock photos covering a range of categories such as textures, animals, technology, water, fire, jobs and careers, buildings and more. These stock photos are 100% free and are also royalty free. But you can´t redistribute them, or use them with anything that could be viewed as offensive. Freepixels offers free high resolution stock photos for use in both personal and commercial design projects. You can easily search for images with their advanced search filters. They have over 4,544 Images in 40 Categories. 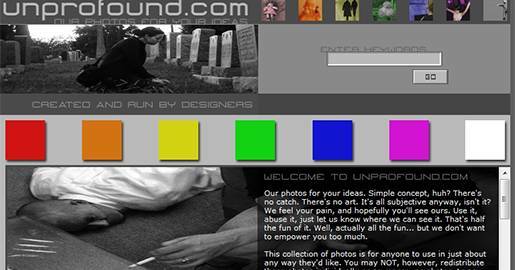 Unprofound has a collection of photos for anyone to use in just about any way you like. However, you may NOT redistribute these photos individually or en masse, as photos, to any other Websites or offline buyers. The photos themselves are still the intellectual property of their respective owners and you are merely receiving permission to use them in your personal and professional projects. Photos are sorted by the basic colors with a basic search feature. 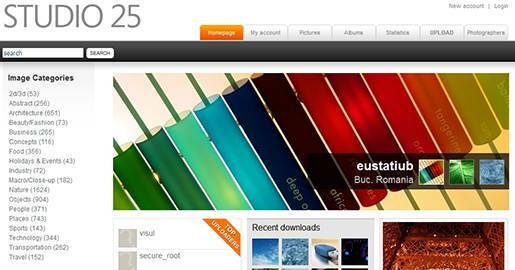 Studio 25 offers 6,600+ high quality images categorized into 18+ categories. Before you can download any images, you need to Sign up for a free account. The RGBStock RGBStock has a more than 66,355 of high quality stock photos and free graphics for illustrations, wallpapers and backgrounds. All images on RGBStock are free for personal and commercial use. You may use them in digital format on Websites, blogs, multimedia presentations, broadcast film and video or in printed material such as magazines, books, brochures, flyers and text books. You can search the Website for photos using keywords. Registration is required before you can download any images. 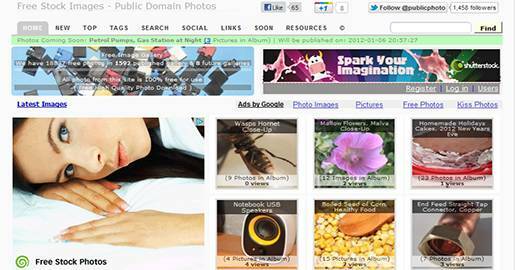 Public Domain Photos have more than 18,837 free photos in 1,592 published galleries with 8 future galleries. All photos from this Website are 100% free for use. The Website is continuously updated with new photos. Each photo can be downloaded in at least four dimensions. 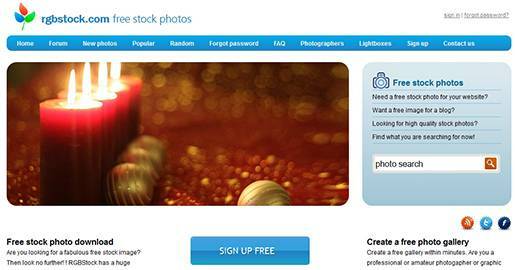 Everystockphoto is a license-specific Photo Search Engine. You can view a photo´s license by clicking on the license icon, below and left of photos, so be sure to look at the licensing terms before downloading them. Currently they index and search millions of freely licensed photos, from many sources, and present them in an integrated search. 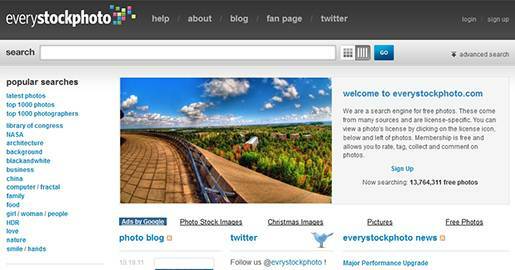 Everystockphoto.com was launched in April 2006. Membership is free and allows you to rate, tag, collect and comment on photos. Do you Need More Photos? There are many more Websites that offer free images for your next project as shown in the reference below. In this post, I reviewed the top 21 Websites devoted to your free photo needs, and I am confident that at least one will meet your requirements. If you have any other Free Photo Websites to add or something else to say, please share your opinion in the comments section below. Your opinion matters, unless it is a Spam. You have not listed: http://www.kozzi.com. This site had also great free stock photo libraries. :) Anyhow, thanks for the post Boutros. Awesome collection. It is very helpful information for designers. Thanks Kris. Didn’t know that. 58 queries in 0.457 seconds.